Comedy writing and acting duo Caroline Curran and Julie Maxwell have teamed up for a bawdy and hilarious take on the perennial Christmas classic ‘It’s a Wonderful Life’. 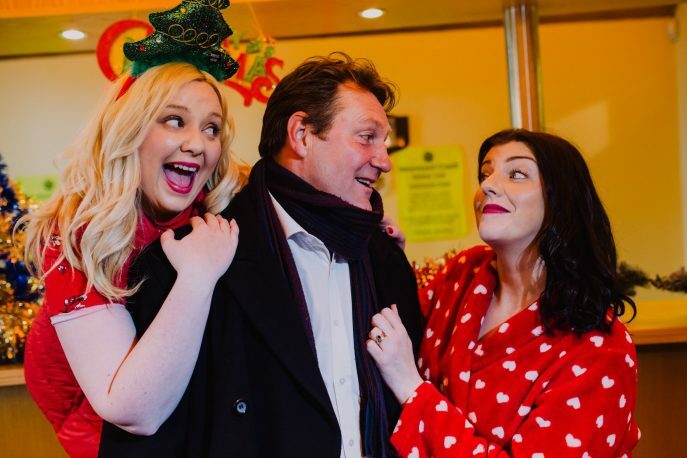 This year’s big festive show at Theatre at the Mill ‘It’s a Wonderful Wee Christmas’ combines all the charm of the original heart-warming story with some added Belfast banter. 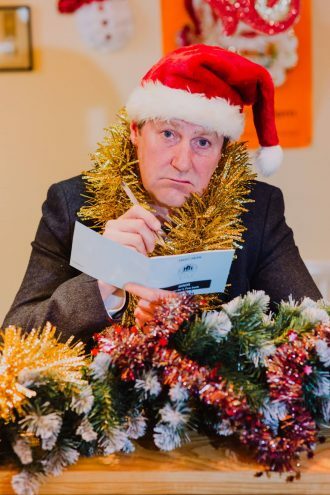 This is the fourth Christmas show penned by and starring the two best pals and they have brought together the familiar team of Paddy Buchanan, Jimmy Doran and Abi McGibbon and director Finn Kennedy. Instead of 1940’s small town America it’s set in modern day Belfast where an angel is more likely to get wings by downing a can of Red Bull than helping out a troubled soul and ‘Every time a Bell rings…..’ it means last orders at the bar. 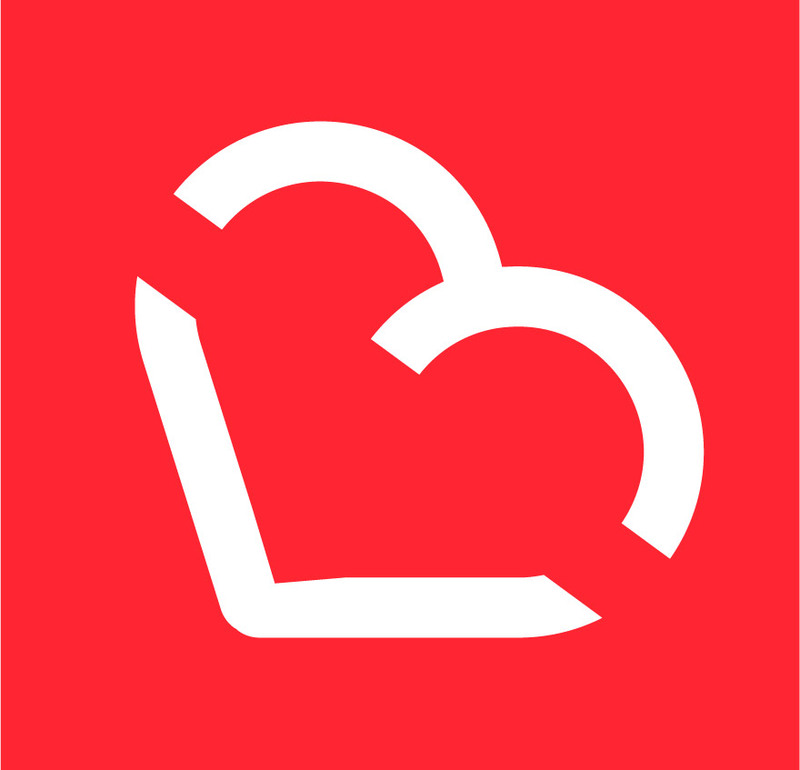 Central to this seasonal tale is Geordie Bailey, the big hearted manager of the Credit Union who is the heart of his community, helping his cash-strapped customers eke out enough to enjoy Christmas. Just like the Jimmy Stewart character, Geordie’s ambition to travel and see the world has been stymied and he reaches the end of his rope when his office is robbed on Christmas Eve. Stepping in to save the day is very unorthodox angel, Clara Crackingbody, a potty-mouthed force of nature far removed from the gentle Clarence Peabody of the Frank Capra version. Clara descends from ‘upstairs’ to convince Geordie that life is worth living and ‘no man is a failure who has friends’. It’s a Wonderful Wee Christmas is full of topical jokes. In this modern day Belfast fable nothing runs smoothly – bus lanes, the Glider or ‘Stormount’ but daily life goes on with a combination of resignation and black humour. Will Clara Crackingbody get her wings? Will she help save Geordie and the credit union? 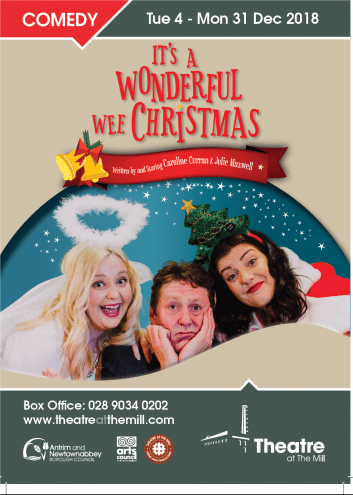 Find out in ‘It’s a Wonderful Wee Christmas’ at Theatre at the Mill from December 4-31. The Pirates of Penzance sail in this weekend!